Unique Beads, Charms, Supplies, Handmade Jewelry & More! Butterfly with Pave Cz Carlo Biagi clip on charm is full of sparkling Cubic Zirconia stones, and perfect for a nature theme charm bracelet. 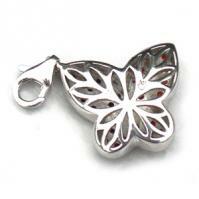 This deluxe charm is a great way to personalize charm bracelets. Please select the color from the drop down menu.